Spanish: �Dale un golpe al reciclaje! 1 "What is that?" asked Ray, pointing to the big lumpy bag in Grandma's hand. 2 "This is my lonely sock bag," said Grandma. 3 "A lonely sock bag?" asked Ray. "How do you know if socks are lonely?" 4 "Well, when you buy socks, they are in pairs. Most people use them in pairs. When one of the pair gets lost, the other one is lonely," said Grandma. She winked at Ray. 5 "What are you going to do with them?" asked Ray. 6 "That depends on the sock," said Grandma. "Do you see these?" She held up a handful of white socks. "They are still in good shape. They do not have holes in them. I can use them for all kinds of things." 7 "What kinds of things?" asked Ray. 8 "Why don't you play with this sock and see if you can get some ideas?" asked Grandma with a smile. 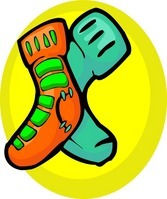 Feedback on Sock It to Recycling!